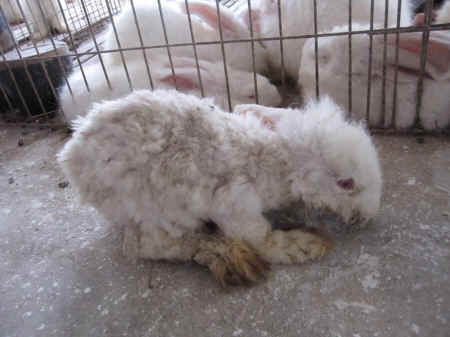 Please urge Free People to drop angora wool immediately in favor of animal-friendly materials. You can send a note to the brand’s president through the form below. As heartbreaking as this trip was, it was also extremely meaningful because it exposed the failure of the auditing system on which so many companies rely—breaking the “humane farming” myth wide open. 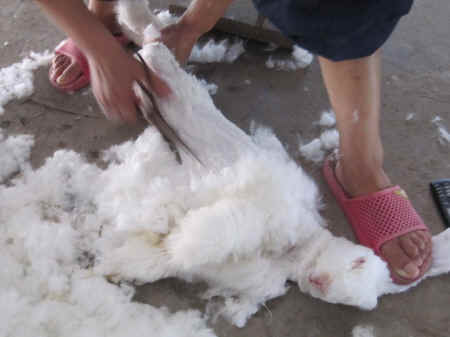 To date, more than 110 companies have banned angora, yet Free People continues to sell it. There’s no such thing as “humane” angora wool, sheep wool, fur, down, leather, or anything else that’s taken from an animal. 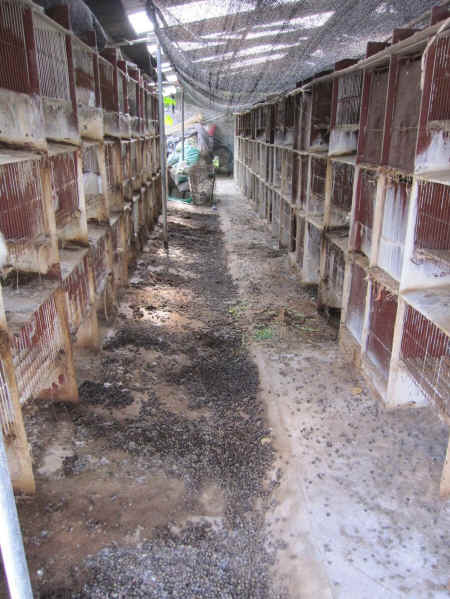 PETA visited angora farms in China deemed “humane” by third-party auditors and discovered suffering, neglect, and cruelty beyond imagination. After PETA Asia’s shocking look into Chinese angora-wool farms revealed that live rabbits have the fur ripped out of their skin by the fistful, millions of people worldwide were stunned. Many people thought that the wool was obtained without harming the animals, but when they saw the cruelty, they spoke out loudly and forcefully, and retailers worldwide listened. As a result, dozens of top retailers banned angora, including H&M, Ann Inc., Zappos, QVC, Calvin Klein, Tommy Hilfiger, and Forever 21. However, some brands, such as Free People (which is owned by Urban Outfitters), continue to sell angora. Some companies say that they trust their suppliers and that third-party audits deem them “humane.” Sound familiar? Knowing that the auditing system is a farce that protects suppliers and retailers rather than animals and that animals used for clothing suffer tremendously, regardless of any “standards” that might be in place, we kept pushing. Officials at one international clothing company that trusted its auditors agreed to take a trip with us to prove its claims. PETA representatives—a senior corporate liaison who works directly with retailers to adopt animal-friendly policies and a veterinarian—and a representative from PETA Asia traveled to China to meet up with company officials and an auditor to see what was really happening on these farms. The group visited five farms in different regions of mainland China. And unlike typical farm audits, these visits were all unannounced. Without exception, the members of the group confirmed with their own eyes what PETA Asia’s investigation had previously revealed—that live rabbits’ fur is ripped out of their skin and that they’re forced to live under horrendous conditions, despite assurances to the contrary. Rabbits were yanked out of enclosures by their sensitive ears and pinned under workers’ feet while they were violently sheared. At one site, a rope used for suspending “problem animals” by their forelimbs in order to pluck or shear them more easily dangled from the ceiling. The temperature was over 100 degrees with 80 percent humidity, and the rabbits were given little to no protection from the elements. 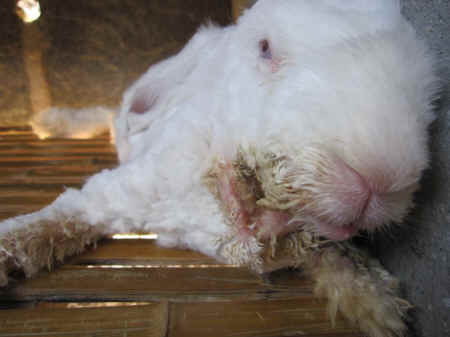 Most of the rabbits were suffering from a severe skin irritation caused by excessive salivation. Their saliva ran down their necks and onto their chests and forelimbs. As a result, these areas of skin had become severely infected. Many animals exhibited rapid, open-mouthed breathing brought on by heat stress or respiratory disease. Many rabbits’ heads were tilted at a 90-degree angle. This condition is caused by damage to the ears, likely from being roughly handled every 30 to 60 days when they’re yanked out of cages for shearing. Because of the head tilt, they were unable to orient themselves to eat or drink and were very slowly dying of starvation or dehydration. Veterinary care was grossly inadequate or non-existent. In many cases, the rabbits weren’t offered any treatment for severe and chronic infections, sores, respiratory distress, malnutrition, blindness, or neurological damage. Some were so sick and weak that they lay in their own waste and didn’t respond to being touched. OOf the farms that the group visited, rabbits were not euthanized on site under any circumstances, no matter how sick or injured they were. They were left to languish for days, weeks, or even months without relief or treatment before finally succumbing. If the auditor saw then the same conditions that the group saw, how could he have reported that nothing was wrong? In China, there are no standards in place to regulate the treatment of animals and no penalties for their abuse, and this indifference toward the welfare of animals is often reflected in the culture. What would be considered horrific cruelty in the West—such as feeding live animals to big cats for the amusement of audiences—might be commonly practiced in China and therefore be acceptable to a Chinese auditor. Such cultural differences inevitably influence the findings of an audit. Farm evaluation forms are open to broad interpretation. Even when a checklist appears to be objective, the questions might, in fact, be highly subjective. For example, the response to a question such as “Are the rabbits given water?” might be “Yes” because some animals do have water, even though others don’t have any. Or the answer might be “Yes” if an owner says that the bowls are empty because the rabbits have already drunk the water they were given, even if this happened a day earlier. Another question open to interpretation might be, “Is there a veterinarian on duty at the farm?” Even if the veterinarian comes only once a week or once every two weeks, an auditor might nevertheless answer “Yes.” Or perhaps the person tasked with providing animals with veterinary services didn’t attend a traditional veterinary school or is ineffective, drunk, or on vacation. Many auditors and farm owners are friends. When the group visited the farms, they were welcomed into the owners’ homes, given refreshments, and even taken out to lunch. And in many cultures, including in China, it’s considered rude not to accept an invitation. However, accepting such invitations makes it more difficult to report later that a farm owner abuses animals. There’s no such thing as “humane” angora wool, sheep wool, fur, down, leather, or anything else that’s taken from an animal. All animals used for clothing suffer tremendously, and the best thing that you can do to help them is to buy clothing made with only vegan synthetic or natural materials.